This picture is being passed around via email and I do not know who took it, but it is an extraordinary picture. 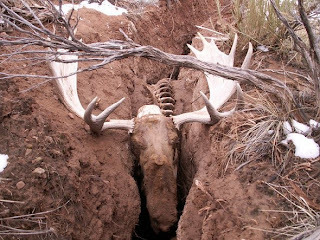 Moose have to avoid hunters, predators, worry about food supply, and disease and as we see here, the condition of the terrain that they live in. What are the chances of this happening? 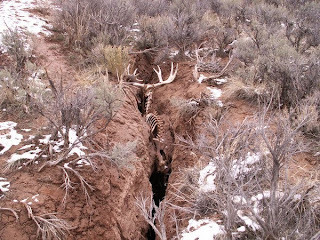 Apparently the moose had been distracted in some way and didn’t see this large crack in the ground. Once it became trapped there was no way it was going to be able to escape. This followed by starvation and predators having their way. Not a very pleasant way to go….